But then in the second sermon I heard that day, focused a lot more on the spiritual side – that Jesus himself was the bread of life! The bread that Jesus is talking about in this reading is that which “comes down from heaven” and which “gives life to the world”. In John’s gospel this is exactly the same kind of language which is used to describe Jesus himself. He is the one that gives life to and sustains the world! After what has been a very manic week for me, this idea of allowing God to sustain me just kept coming back to me over and over again! Sometimes we try to fill that void, whatever it may be with worldly, physical things. But the problem with that is, it is that ‘food’ that perishes. What Jesus is offering here is something eternal, something that endures. 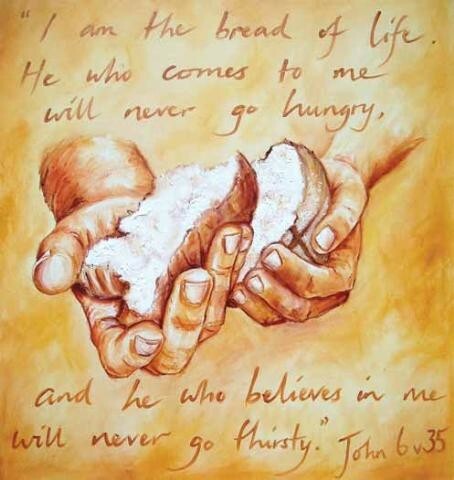 When Jesus says that he is the “bread of life”, it means that he is God’s life-giving and life-sustaining gift to the world. We do not have to do anything to earn this gift. We only have to trust God and accept it freely. So today, don’t choose this ordinary, perishable food because you will constantly be wanting more. Ask for this life-giving and life-sustaining food that God offers through Jesus, so that you may never go hungry or thirsty again!